Poolworld Philippines Inc.Instruction Videos - Poolworld Philippines Inc.
Once chlorine, salt and bromine were the only viable versions of pool control available. Unlike chlorinated water, ionised pool water will not dry out your skin, or leave your skin smelling of chlorine. A Bionizer pool will not affect your bathing suits, your hair or your pool covers. Besides that our Bionizer system is eczema and asthma friendly and will no longer give you sore eyes. Bionizer has designed a new generation ioniser which is microchip and software controlled – and that outperforms all other pool systems. The Bionizer unit is unaffected by heat and will not corrode your pool equipment or surrounds. 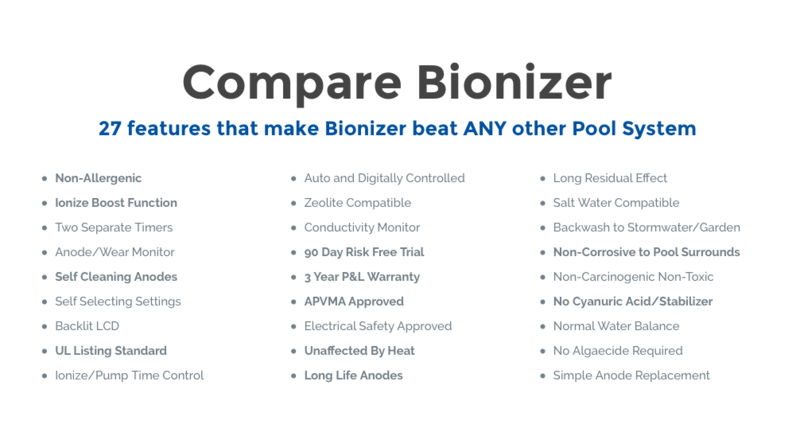 Bionizer went to work for several years to add all the essential features that over 17 years of industry experience has shown what pool and spa owners look for in a sophisticated, user-friendly pool control system.